Team games to learn basics of effective team functioning. Before we go on to discussing some team games let's understand the concept of team in an organisation. Team: A group becomes a team when an interdependent task or function requires the members to interact with and influence each other to accomplish the group task. Whew! that's one long sentence! Why are teams important in organisations? 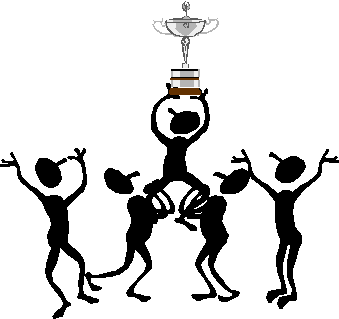 teams are set-up to help individuals focus their efforts to achieve organsiational goals. Teams function effectively when they are fit. Teams need practice in the areas of team fitness to function effectively. Effective teams are synergistic because of diversity. The areas of team fitness are: Customer Focus, Direction, Understanding and Accountability. Facilitate the understanding of the concept of teams. Check the list above for the kind of concepts. Make the concepts of team experiential rather than abstract. Let's now look at the first of the team games. Team Game 1: Customer Focus - 'Pass the customer. 1. This game is a large group game. 2. Have the group stand in a semicircle. 3. Hand one straw to each person. 4. Ask each person to put one tip of the straw between their lips like a cigarette and hold it there. 5. Beginning with one end of the semicircle, balance the 3x5 card at the fold on first person's straw. Tell them to imagine the card to be their customer. 6. Now ask her to pass it on to the straw held by the next person, without using her hands and without dropping the card. 7. The second person should now pass on the 'customer' to the third person without dropping 'her'. 8. This way the game continues until the last person manages to pick up the customer from her neighbor's straw on to hers. 9. This is a very exciting game and you'll hear a lot of shouting of instructions from different quarters on how not to drop the card. 10. When somebody or the other makes a mistake and the card is about to drop, there are a lot 'uh-oh's and groansfrom the group. 11. Perchance if anybody in the groupdoes drop the 'customer', the game has to begin again from scratch. to the point at which all the participants were focusing on keeping the 'customer' from falling. That these are the basics of 'customer focus'. Let's now look at the second of the team games. Team game 2: Power of synergy: 'Count the squares' 1. Display the following figure as a ppt. or on a display board. 2. 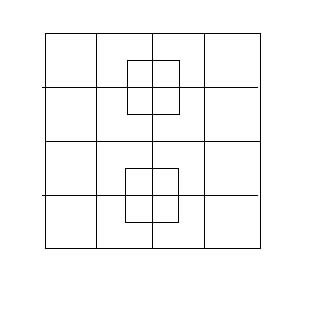 Ask the participants to count the number of squares in the figure and note it down. Have them do this task individually. Thsi is the first round. 3. After the first round is over have them call out the number they have noted down. 4. Note this numbers on a display board. The numbers will range anywhere from 17 to 36. 5. Now ask them to pair up with their neighbors and do the task again. This is the second round. 6. Have the pairs call out their scores to you once they have finished and note them once again. The numbers will range from 32 to 40. 7. In the third round have them work in groups of fours and fives or in just two large groups. Take their scores again. This time the number will hover closer to 40. 8. Ask the group who counted forty to show the rest of the group how they got the number. In the discussion that follows draw the attention of the group to the way in which the number of squares increased as more people got together to solve the problem. Synergy is all about putting together single elements and obtaining results that is more than just the sum of the single elements. Draw their attention to the factor of synergy that was operating in this game. Here's the pictorial representation of the answer to 'count the squares' game. This is the third of the team games. It has been added as an answer to a request from a visitor to the website. I hope that others will find it useful too. I would love to hear your experience with the games on this website. 1. This team game aims to provide the demonstrate the significance of internal and external customers. 2. It follows two simple patterns - give to those who depend on you for a service and receive from those you depend on for a service. 3. You require several balls of wool of different colors to play this team game. 4. Have all the participants stand in a circle. Give each a role to play, that typically represents the various departments/products/facilities of your organisation. 5. For convenience let's imagine a group of people belonging to a school. So some of them will be teachers, one the Principal, one the accountant, one the administrative officer, one the security guard, one the transporter and one of course will play the student. 6. Each participant is given a ball of wool. Ask the participants to hold the ball with them while they hand out the free end to someone from whom they want a service. 7. As a person receives the end of the thread from her customer she describes her responsibility towards her customer. Others who are listening help her to add to her list anything that she might have forgotten. 8. So for instance the student gives free end of the wool to the teacher. The teacher tells the others the kind of service she provides the student and the manner in which she provides it. 9. The student realises that she requires service from the Principal as well. She will then release more wool and ask the Principal to hold it somewhere in between her and the teacher. Now the Principal vocalises the service that she provides the student. 10. Similarly, the Principal will hand the free end of her ball of wool to the teacher. The teacher will now vocalise the service she provides to this internal customer. The Principal also depends on other stakeholders for some service or the other. She will therefore draw enough wool to hand a point on it to the accountant, and another point on it to the administrative officer. This way the game goes on until every participant has either given a piece of wool or received a piece of wool. 11. To make the concept clearer use one color per partiicpant. 12. Thus you will see a web forming among all the participants. The largest number of connections will be between the student and the other stakeholders of the school. 13. This is an important concept to communicate during the debrief of the game. It demonstrates that every contact that a student (external customer) makes with the different stakeholders of the school is a point of sale. As such service provided at the point of every contact has to superior in quality, consistent and goal-oriented. 14. The teacher is responsible to provide the student the most meaningful and successful learning experience; the Principal is responsible to organise this learning experience in the most effecient way as well as ensure the well being of the student; the transporter is responsible to reach the student to the school and back home safely; and the list goes on. 15. Once the concept of the external customer is clarified, the internal customer concept is focussed on. 16. The web makes it very clear that while the student is in contact with every other stakeholder of the school, the other stakeholders are connected too. 17. The point to be drawn out in the debrief is: unless the other stakeholders are connected to each other in empowering interdependent relationships their service to the student will suffer. 18. Are you wondering in all this who is the student responsible to? 19. Don't worry this team game takes care of that too. Before beinning the debrief, publicly assign yourself the roles of 'parent', 'society', 'economy', 'future family/dependants' of the student. As such hand the ends of different pieces of wool representing all these stakeholders to the student. For other categories of training games go to the Training games page and follow the links in the blue box. If you would like to know more about team games go to the Contact Us page.